In a town like Flesherton of only 700 people, you may be quick to assume that certain varieties of international goods and fine foods are few and far between. However, Gary, the owner of the Leslieville Cheese Market, is challenging this idea and is challenging you to think twice before jumping to that conclusion. The cheese shop on the main street of Flesherton is home to an endless variety of Canadian and International cheeses, cured meats, homemade dips, smoked fish, and olives. They also have an abundance of local and international pantry items such as crackers, coffees, sauces, chutneys, jams, and jellies to stock your shelves. Convinced yet? The cheese market is now in its 6th year in Flesherton, but it has not always been located there, and neither has Gary! Gary has had many different careers including being a florist in New York City and Toronto, an interior painter, and a bartender. 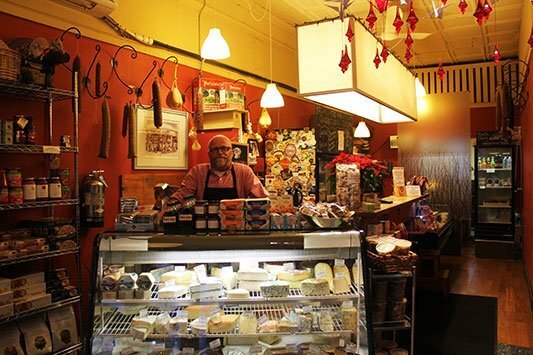 It was while living in Toronto in the Leslieville neighbourhood that Gary found the Leslieville Cheese Market. He started working there and says “It was just a really good fit’… ‘it was like I [Gary] was born to sell cheese! I loved it and I was really good at it”. After working in Leslieville, Gary decided that he would like to move up to Flesherton where he had had a weekend getaway for years. He saw how busy other local small businesses were doing in Flesherton and he decided that he wasn’t ready to leave the cheese market behind! Therefore, the Leslieville Cheese Market’s second location opened on the main street of Flesherton. After establishing his own business, Gary says that the move was a great decision and he loves what the location has brought to the cheese shop. The shop is right on highway 10 which makes it the ideal for people on their way to Sauble Beach from the cities. Gary says that even though Flesherton is a smaller village, he believes that because of the highway he gets just as much traffic, if not more, than some larger towns in the area. There is also a great customer base to build with skiers from the Beaver Valley Ski Club in the winter and cottagers on Lake Eugenia in the summer. There are also lots of people from cities that have retired to the country. Plus, we can’t forget to mention all of the great local residents as well! He says that although opening in a smaller town was “a bit of a gamble” as you do not know how your business will be received, it has been great and the people are definitely coming! Now that the cheese shop has made its mark on Flesherton, they are building their reputation. They are widely known for their vast selection of cheeses of course, but did you know they are also famous for their incredible grilled cheese sandwiches? They have three different flavours: cheddar bacon, aged gouda, and gruyere with sweet onion balsamic chutney. I don’t know about you, but they all sound delectable to me! Aside from their products, Gary says that they are also recognized for their top notch customer service. He along with his three employees take their customer service very seriously. This small business understands the importance of making the connections with their customers, and they take pride in being knowledgeable and insightful to best serve their clients. Gary also says that one of the things he is most proud of doing with his business is giving back to the community. Every summer they host an opera night fundraiser. It was formerly held in Michael Schmidt’s barn and is now held at the Kimberley Hall. There is an eight course meal along with a DVD presentation of an opera. Furthermore, he also started “A Taste of Flesherton” at the Flesherton Fling. Here, local vendors bring a food item that represents them and people can then purchase tickets to get a taste. Over the past 6 years, Gary says that he has raised approximately $10, 000 for the community for various causes including the Macphail Memorial Elementary School band, the library, the hospital, and the local food bank. Moving into the future Gary says that he hopes to keep the business going strong in Flesherton. “It’s a great and unusual little town, it’s so hip for 700 people with all of the art galleries, foods, and musicians up here: it’s great” he says, “…moving here was the best thing I ever did, and hopefully we’ll be here for six more years”. It is clear to see that any assumptions that a smaller community would not be home to a shop with such a variety of cheeses and fine foods have been proven wrong. You can visit the Leslieville Cheese Market at 10 Sydenham St, Flesherton, Ontario N0C 1E0.